Help your child discover the natural world and the joy of building with this Esschert Design "Build It Yourself" Bird House Kit. 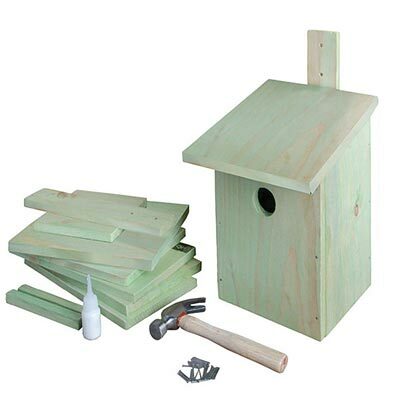 This package offers all you need to help kids build a fantastic wren or chickadee home, including a detailed diagram on the back of the packaging. The precut, wooden panels form a hardy shelter, including an overhanging roof and extended mounting tab, while the 1.25" diameter entry hole allows small birds to easily use the home. The included hammer, nails, and glue streamline the assembly, and the wooden unit may be painted for a further custom look. The extended mounting tab makes it easy to place this item against a wall, post, or tree, and its classic shape is perfect for a few types of songbirds. The DIY design is also fantastic for use with a kids crafting party or scout group. Encourage your child to become a champion of wildlife with this "Build It Yourself" Bird House Kit. Designed for ages 3 and up. Assembly required.